layout_weight assigns weight to the children of LinearLayout. For example, if there are three child items within the LinearLayout, then the space assigned will be in proportion to the weight which means the child with larger weight will be allow to expand more. Thus weight decides how much space an item is allowed to occupy on the screen. In general, if each item is assigned a weight, then the space assigned to an item would be space equal to = (item’s weight) / (sum of weight of every item in Linear Layout). If you don’t assign any weight, its default value would be zero. In this example, we will try to understand how exactly weight influences the space assigned? In our main screen we have three buttons within the LinearLayout layout, sharing the horizontal space. We have assigned a weight of 70, 1 and 29 to the buttons. We also want to test the weight’s influence on button’s width at runtime so we have three text items which will allow us to set the button’s layout_weight dynamically. In our main activity, we have three buttons sharing the horizontal space. 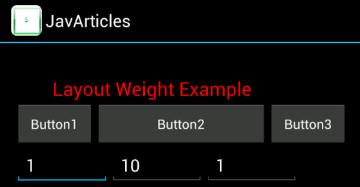 We also have three text items to change the layout_weight of the buttons. In the MainActivity, we attach a TextWatcher listener to each text item so that as soon as the weight is changed, the button’s latout-weight is reset and layout re-drawn. Main screen has three buttons and three text fields to change the layout_weight dynamically. Change the weight. The buttons size changes.